The raging three-alarm fire tragically consumed the Oreo sleeve, which had only been purchased last week. NEWARK, DE—A three-alarm fire tore through a family home on Newark's East Side early Saturday morning, completely gutting the two-story residence and tragically claiming a half-sleeve of Oreo cookies that was trapped inside a cupboard. "This was one of the fastest moving and most destructive residential fires we've seen in a very long time," said Newark Fire Department chief Al Pascarelli, who did not mention the partial box of chocolate sandwich cookies that perished in the intense heat and towering flames. "By the time we arrived, the building was already completely engulfed. It just went up so fast, there wasn't anything we could do except try to contain it." "Given the extent of the fire, there was no hope of entering the home to perform a search and rescue," continued Pascarelli, tactfully avoiding the grisly details of the lost treats' final moments. "We will continue to work with law enforcement and the county coroner to determine the exact cause of this terrible tragedy." Pascarelli confirmed the fire broke out around 12:20 a.m. at a Grove Street property occupied by Mike and Sheila Donlin, three young children, and as many as six perfectly good, untouched Oreo cookies, all of which were present at the time of the blaze. The rapidly spreading conflagration may have been sparked by faulty electrical wiring in the kitchen and likely trapped the tasty cookie-and-cream treats inside the pantry as the blistering-hot flames encircled the snacks and, finally, incinerated them. At press time, it remained unknown whether the lost cookies were of the original variety, the kind dipped in fudge, Double Stuf, or a St. Patrick's day seasonal pack featuring green, mint-flavored cream filling. The tragic demise of the name-brand snacks has left the community in shock. Numerous residents could be seen gathering beside the still-smoldering rubble Saturday to comfort one another and pay their respects to those lost, which, in addition to the Oreos, may have included a stash of Kudos-brand chocolate-chip granola bars, a mostly full bag of Rold Gold pretzel rods, and a jar of Skippy smooth peanut butter that may have been used for dipping. "This is awful—just awful," said neighbor Karen Beliveau, 43, who appeared visibly shaken as she struggled with the horrifying reality that the Oreo cookies were truly gone and would never get to be munched on and enjoyed. "My heart just breaks for that poor family. I can't even imagine the pain and heartache their loved ones must be going through." "My God," added Beliveau, pausing to compose herself. "I don't know how you even begin to move on from something like this." According to experts, the Oreos likely suffered a grotesque end. Although the sleeve may have provided initial protection from the acrid smoke, the extreme temperatures—which probably exceeded 1,000 degrees—would have eventually caused the cookies' cream centers to boil from the inside out while the melting packaging entombed them in a scalding coat of liquefied plastic. 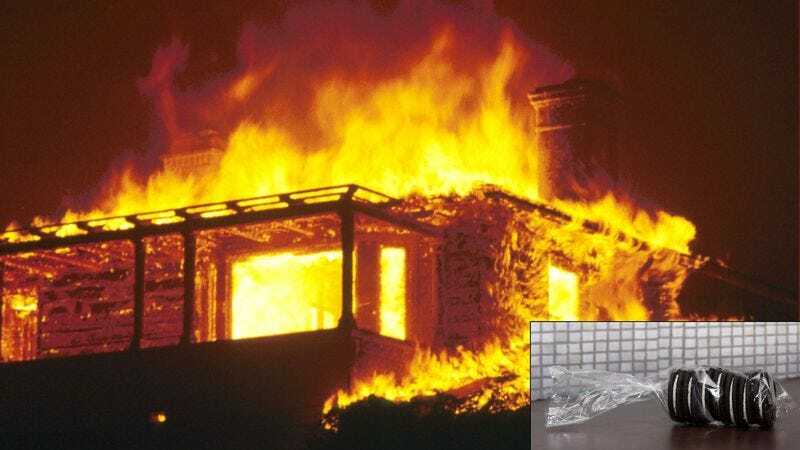 Additionally, the sweet sugar within the snack itself likely added fuel to the fire, resulting in all the cookies fusing into a single fire-blackened mass and potentially making it impossible for authorities to identify their charred remains. Unlike his unfortunate cream-filled cookies, property owner Mike Donlin managed to survive the blaze after a neighbor reportedly dragged him from the burning house in the moments before it collapsed in flames. When contacted for comment, the now tragically Oreo-less Donlin, who is currently recovering from burns and smoke inhalation, said words "can't even begin to express" the level of anguish and devastation he felt. "Everything I cared about was taken from me in an instant," said the profoundly distraught 37-year-old father, apparently racked with overwhelming guilt and regret at not having reached his helpless Oreos, clutched them tightly to his chest, and delivered them to safety by crawling beneath the thick smoke. "I just can't believe my [Oreo cookies]—my own [chocolatey snack-time treats]—are gone. They were so young, they never had a chance to [be dunked in milk and eaten]. This is the worst thing any [Oreo-lover] could ever face." "All I can ask is why?" Donlin added before breaking down and sobbing uncontrollably. "Why not me instead?"